Paul Gauguin was born in Paris in 1848 to a journalist father from Orleans, France. Following political unrest after Napoleon III’s coup d’etat in 1851, the 3 year old Paul and his family fled to his mother’s ancestral home in Peru. Unfortunately his father died on the journey, leaving Paul’s French-Peruvian mother to look after him and his sister. At the age of 7, Paul returned to Orleans with his family to live with his Grandfather. At the age of 17 Paul signed up to join the Merchant Navy where he remained until 1871 when he took up a career as a stockbroker. 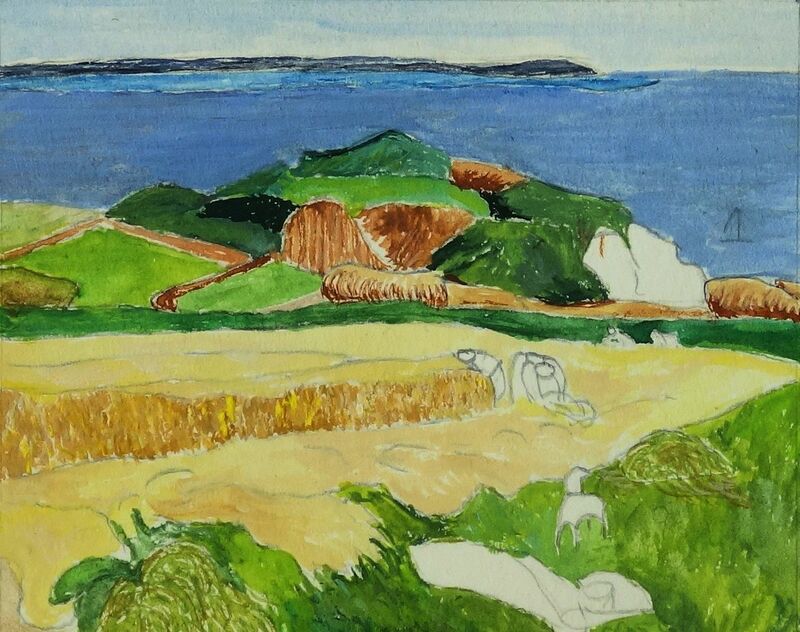 Paul had a strong interest in art, and began to both paint in his spare time and build up an art collection containing pieces by Manet, Cezanne, Pissarro and Monet amongst others. He met Pissarro in the mid 1870’s and began to study under him, overcoming his early difficulties with painting and drawing to be included in the Impressionists exhibitions in 1880, 1881 and 1882. The stockmarket crashed in 1882 and Paul lost his job, allowing him to concentrate full time on painting even though he was not making any money from his artworks. Needing to find his own artistic voice, Paul began to develop his work in a primitive fashion, simplifying his paintings and using outlines and bold flat colours. 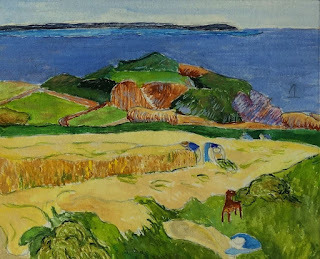 He described this new style as “Synthetism”, concentrating on natural forms, the artist’s feelings about the subject, and purity of colour and form. In late 1888 he stayed with his friend Vincent Van Gogh, where the two had a tumultuous relationship. Both artists suffered from depression, and it was reportedly after what Paul described as an attack on himself by Vincent with a razor, that Vincent cut off his ear – although there is an alternative theory that this story was fabricated to protect Paul who had cut off Vincent’s ear with a sword during a drunken brawl. 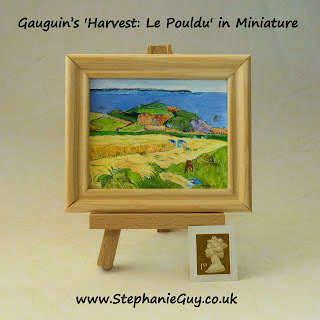 Shortly after this, Paul moved to the rural village of Le Pouldu, where he painted the subject of this tutorial, Harvest: Le Pouldu, in 1890. Success still evaded him, and he spent the rest of his years moving around the French colonies, finally dying from advanced syphilis in 1903, painting and drawing until the end. It was only in 1906 that Paul Gauguin posthumously received critical acclaim, and he is credited with influencing Edward Munch, Henri Matisse and Pablo Picasso amongst others. 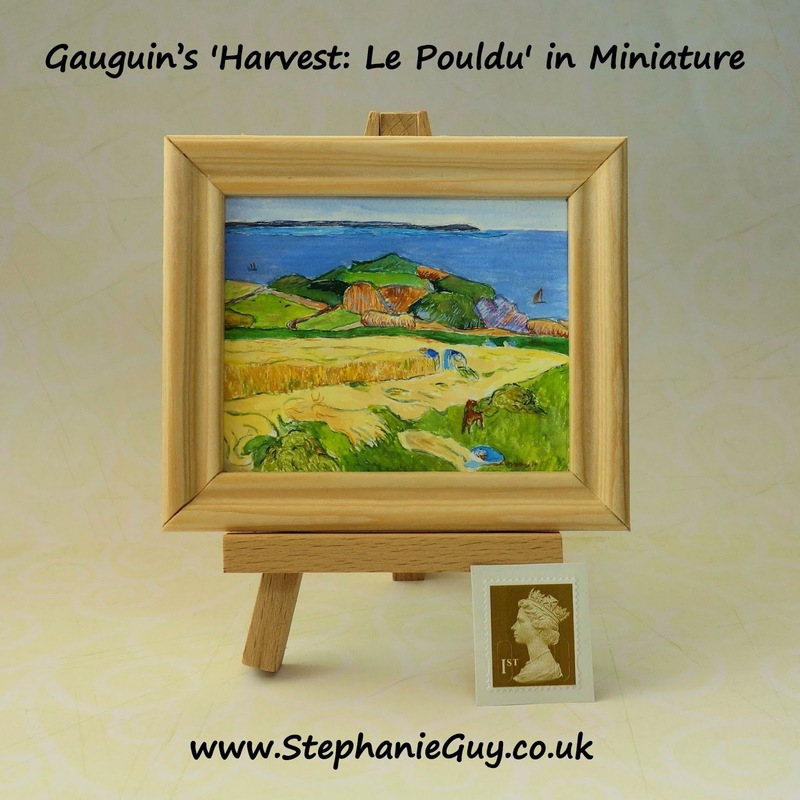 Gauguin’s painting is in oil. To achieve the look without using oils we’re going to use Gouache, which is an opaque form of watercolour. This is an easy medium to use on a miniature scale as it can be thinned readily with water. Unfortunately gouache cannot be varnished as it is very watersoluble, however if we mix it with a little Gum Arabic it will give it a light sheen that is comparable to a light coat of varnish. 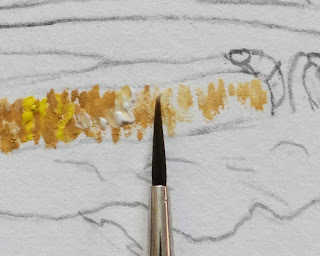 If you wish to use Gum Arabic, mix a brush load of your paint mix with a brush dip of gum Arabic in your palette before applying it to your paper. 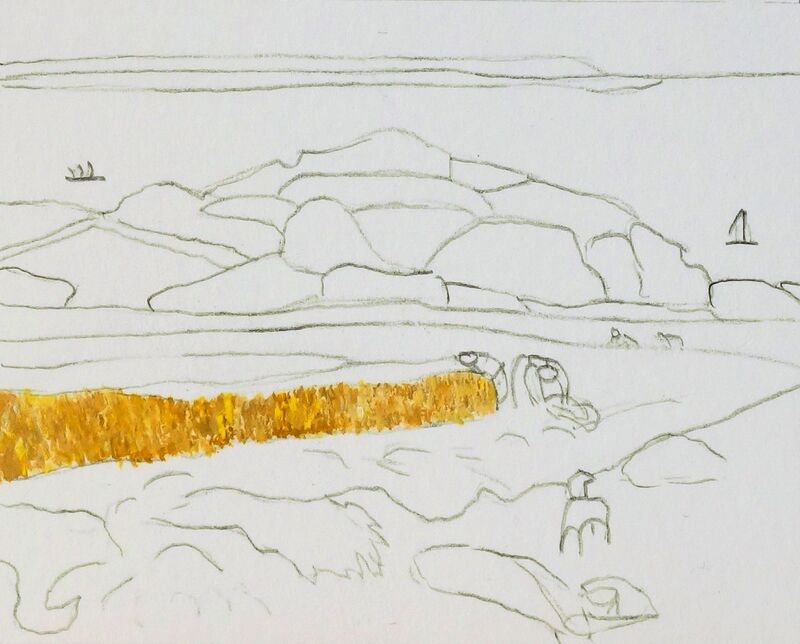 Importantly, be consistent – if you’re using Gum Arabic, use it all the way through, otherwise you will end up with some shiny and some flat patches. If you wish you can substitute gouache for Atelier Interactive Acrylics and a clear painting medium to dilute the paint. This can be varnished after a week. Gauguin’s painting measures 73 x 92.1cm. To find how big yours needs to be simply divide these measurements by the scale you're working in. On a 1:12th scale, dividing by 12 will give us 6.1 x 7.7cm; for 1:16th we need to divide by 16 to get 4.6 x 5.8cm; and for 1:24th divide by 24 giving 3.0 x 3.8cm. Using your steel rule and craft knife, cut out the smooth watercolour paper to the correct size. 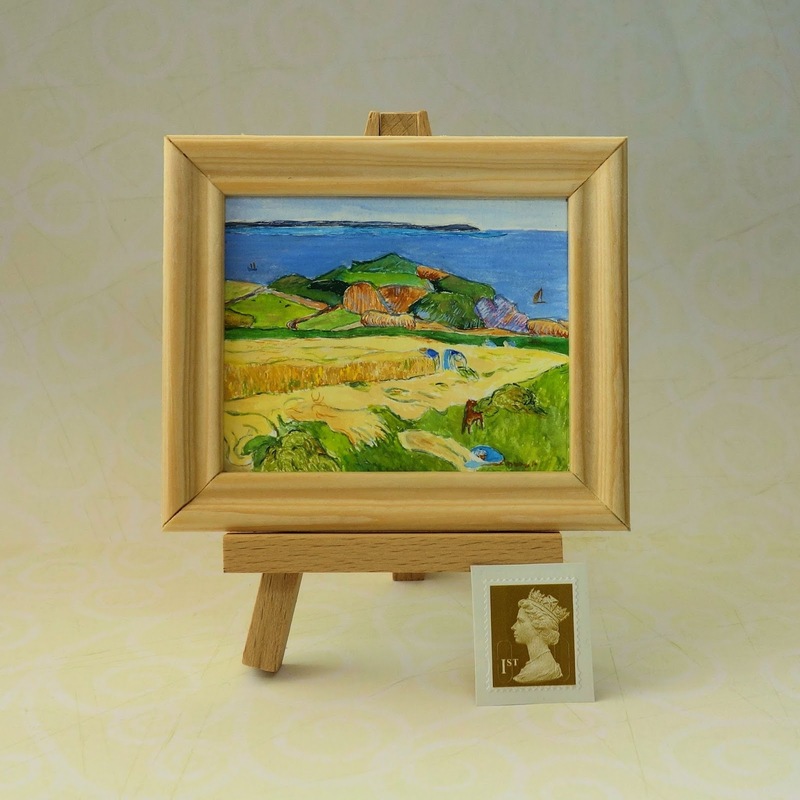 I recommend adding 5mm all around the edges to allow for framing – you can always trim this off later if your chosen frame does not require the extra allowance. 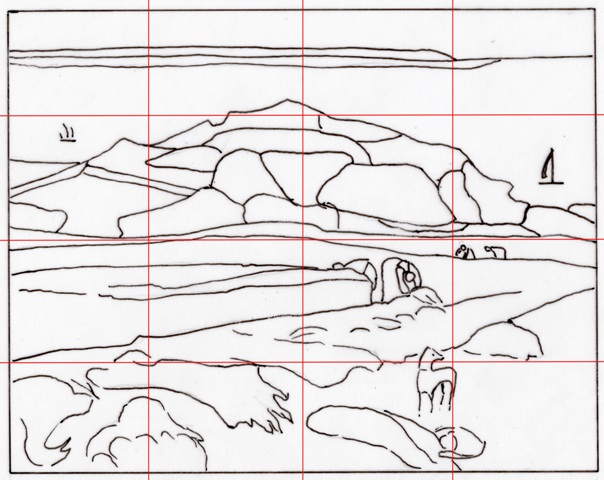 Please draw your grid lines very faintly so that you can erase them later on. When you have finished, erase all of the grid lines with a soft eraser. Be very gentle to avoid damaging the delicate watercolour paper surface. 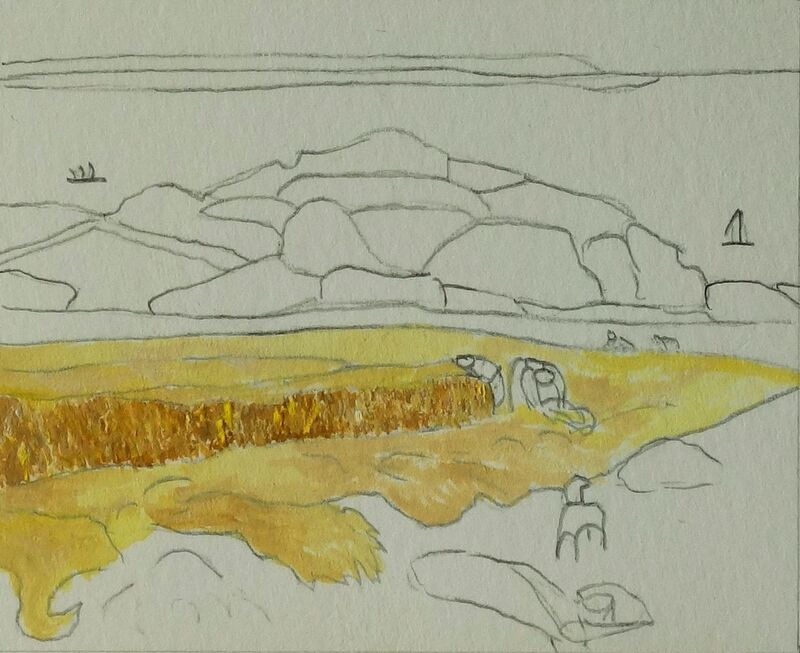 Place a brush load of Yellow Ochre into your palette and if you’re using Gum Arabic, mix in a brush dip now. Mix in a little Zinc White to half of the Yellow Ochre so that you have a varied selection of paint, from very pale beige to pure Yellow Ochre. Using small vertical brush strokes and the size 0000 brush, paint the side of the wheat field, adding in a touch of Primary Yellow here and there. 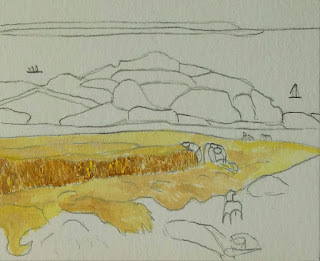 The dominant colour is the varied Yellow Ochre mix. Remember that if you’re using Gum Arabic you must mix it with every colour you use for the whole of the tutorial. 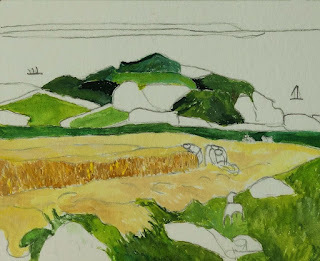 Using your palest Yellow Ochre/Zinc White mix, and a pale mix of Primary Yellow and Zinc White, paint in the rest of the wheat fields. Use an undulating horizontal brush motion to get that waving grass feel, vary the mix and don’t worry too much about your pencil lines showing at this stage as we’ll lose those in a later step. Moving on to the green foreground, mix Permanent Green Middle with Primary Yellow and a touch of Zinc White, and then separately mix Permanent Green Middle with a touch of Primary Red and Zinc White. These mixes should give you a lime green and an olive green. Use these to paint in the foreground green grasses, varying the colour as you go to leave a textured grass effect. Use those same two greens to paint in the darker green strip along the back of the wheat field, and for the lighter green fields on the hill in the background. Within each field try to keep the colours fairly smooth in texture with only a slight variations. Next, paint in the mid-green hills in the background. Mix a fresh dark green by adding a touch of Primary Red to Permanent Green Middle, and use this to add in the very darkest green in the background. The eagle eyed amongst you will notice that I have also painted the bottom left hand corner in a dirty beige. The colours that I used don’t fit very well at this point in the tutorial so I will guide you through that step later. Pick up some of the palest beige colour from step 3 and paint the right hand side of the field on the far left of the hills. Add some of the palest green to the left hand side, and blend the two in the middle. Next, squeeze out a little Burnt Sienna onto your palette. Add Zinc White to some of it, and use these two mixes to paint the brown parts of the hills. Use extremes of the Burnt Sienna/Burnt Sienna & Zinc White to create the vertical stripes in the middle left section and the diagonal stripes in the middle right section. Leave the top of the bottom middle and bottom right sections of the hills as plain paper for now. 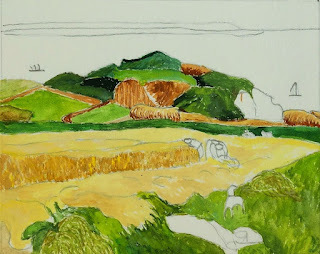 Pick up some of the pale beige and paint the tops halves of the two fields in the background that we left blank in step 7. 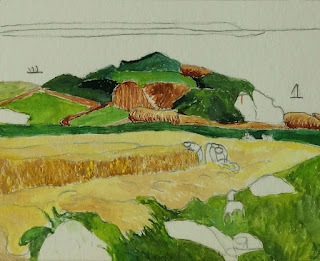 Next use the same pale beige and some of the Burnt Sienna/Zinc White mix to paint the strip that connects these two fields. 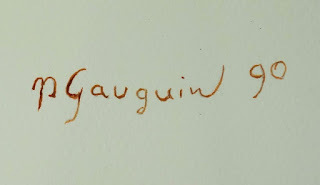 Mix equal quantities of Burnt Sienna, Permanent Green Middle and Primary Yellow to give a light olive green. Paint in the top of the last section on the left hand side of the hills, and then move down to the foreground. Using a wiggly brush stroke, paint in small green curly lines to represent the piles of cut grass on the bottom left and middle right of the scene. Add a touch more Burnt Sienna to half of the mix and finish off the hill on the left hand side. 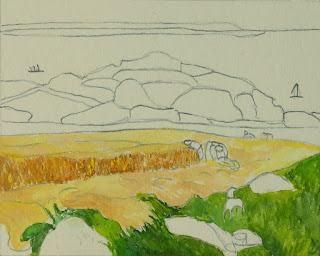 Add a touch of Yellow Ochre to the other half of the mix and paint in some more curly lines on the piles of cut grass. Next go back to your mix of Permanent Green Middle with Primary Yellow and a touch of Zinc White that we used to paint the foreground grasses and fill in any white sections of the cut grass. 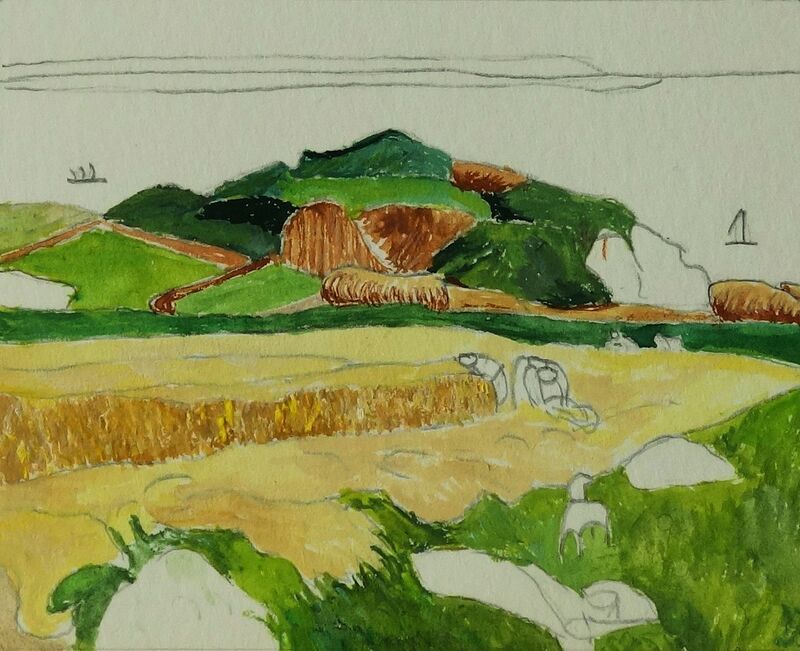 The cut grass on the right hand side spills over to the surrounding area so using Yellow Ochre and Zinc White, paint a few lines at a more oblique angle beneath the pile and to the left of it. Moving on to the sea, mix UltraMarine with Zinc White and switching to your size 2 flat brush, use horizontal strokes to paint in the sea. Now for the reflections of the distant hills, switch back to your size 0000 round brush and place a brush load of Primary Blue on your palette. Using a horizontal stroke paint in the reflections, adding in some Zinc White here and there to vary the tone. To paint the sky, add more Zinc White to your main sea colour of UltraMarine/Zinc White. 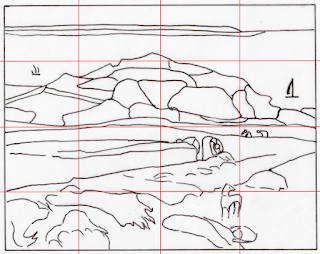 Again, use horizontal strokes with your flat brush. Moving on to those distant hills, place some UltraMarine in your palette and add a touch of Burnt Umber to it to darken it. You only need a small amount of Burnt Umber, the colour you are aiming for is a dark blue, not a blue-brown. Use this to paint in the distant hills with your smallest round brush, and when this is dry, glaze over sections of it with a watery mix of Zinc White to make them appear a little hazy. 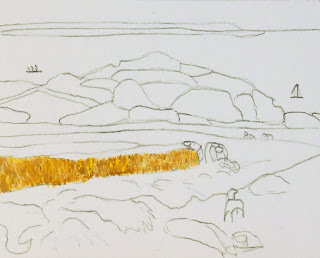 Take a little Burnt Sienna mixed with water and using a few gentle strokes, brush over the centre of the remaining section of the hills on the left. Next paint the dog in the foreground, again using Burnt Sienna. Paint the underside of the dog and under his head in Yellow Ochre mixed with Zinc White and a touch of Primary Yellow. Now mix UltraMarine with a tiny amount of Primary Red, then add a little Zinc White. Using diagonal brush strokes from bottom left to top right, paint over the whole of the section of the hills that we were working on in step 16 allowing some of the Burnt Sienna to show through. Now add more Zinc White and repeat the diagonal brush strokes on the left hand side to lighten this area. To finish off the hills, brush over the bottoms of all the brown hills with Permanent White mixed with Primary Blue and a touch of Primary Red. You’re looking for a pale bluey purple, more on the blue side than the red. I’ve switched to Permanent White here as it is more opaque and covers the colour underneath more easily than Zinc White, however if you don’t have Permanent White don’t worry, just use Zinc White and go over it a few times. Use a directional brush stroke that follows the brush strokes that you used when you painted the brown colour on. Next paint some of this same colour mix onto the bottom of the green hill in the centre right of the scene, and then do the same for the green hill in the centre top. Now mix Permanent White with Burnt Sienna and use this to paint on the top half of all of the dark and mid green hills. Moving to the beige object in front of the dog. I’m not sure whether this is a blanket or pile of cut grain, thankfully we don’t need to know what it is in order to copy it! Mix Yellow Ochre with Zinc White and paint the whole object, leaving a small space for the corner of the blue shawl. 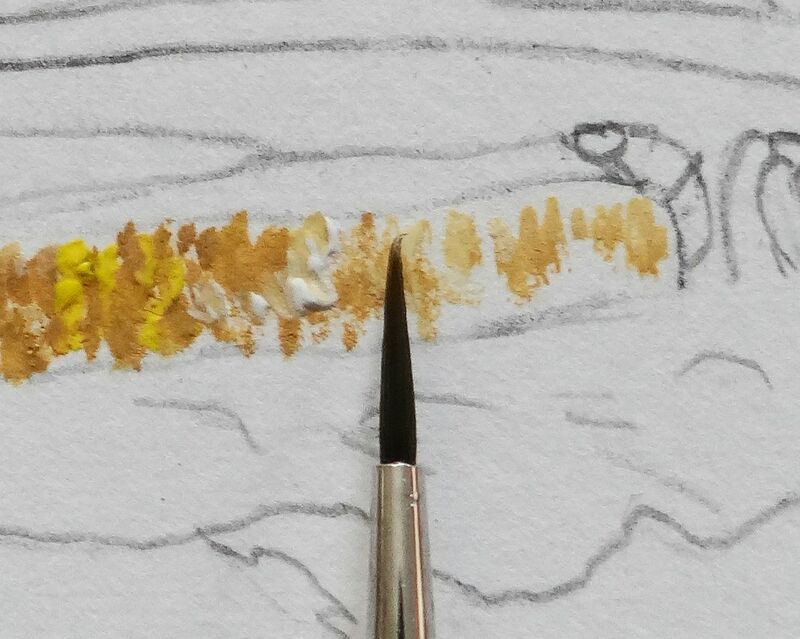 Next add the tiniest amount of UltraMarine to your Yellow Ochre/Zinc White mix to create a dirty beige, and use a curving brush stroke to paint in folds. Remember the bottom left hand corner that I painted too early in this tutorial? You can now paint it using that same dirty beige mix. For the shawl in the foreground and the clothing on the harvest workers, mix UltraMarine with Zinc White, and separately, mix Primary Blue and Zinc White. Using the Primary Blue/Zinc White mix, paint the inside of the shawl, the skirt of the woman on the middle right, and the clothing of the woman on the back left. Add more Zinc White and paint the front of the shawl. Now using your UltraMarine/Zinc White mix, paint the shirt of the woman on the middle left, and the whole of the woman at the back right. 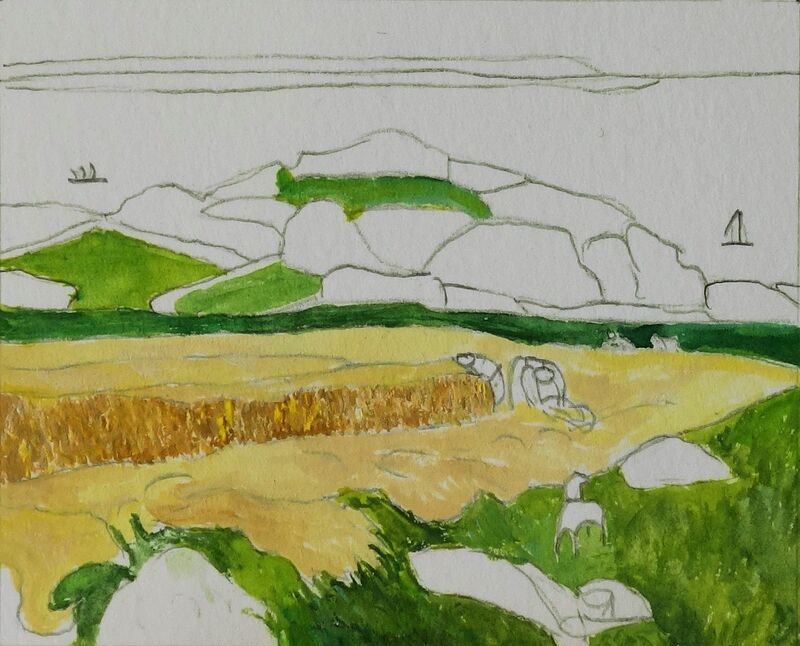 Paint the pile of cut grain that the woman in the middle is holding, using Primary Yellow mixed with Permanent Green Middle and then use Permanent Green Middle mixed with a touch of Primary Red to add in the dark lines. Next, use the Primary Yellow/Permanent Green Middle mix to add in the defining lines in the field. Then go over a few of these lines with the darker Permanent Green Middle/Primary Red mix. Outline the pile of cut grass behind the dog and the pile in the foreground to the left hand side of the scene. We’re almost there now! Add a touch of UltraMarine to your Permanent Green Middle/Primary Red mix to create a dark blue-green. Add sufficient water to make it an inky consistency and use this to outline the hills in the background, the dog, and around the fingers of cut grass in the foreground. Go very gently with the outlining, use your smallest round brush and practice first on a scrap of paper . Remember that it is easier to add more than to take it away, but if you do find that you have been too heavy handed, don’t worry, just dab off as much of the outline as you can and if necessary follow the steps for that area to repaint it. Use this same mix to paint the top of the pie that is sitting on the shawl in the foreground. Next, paint the base of the boat on the left hand side of the sea and add in a couple of dots to represent cows in the field just below the boat. Paint the bottom of the pie in Burnt Sienna mixed with a tiny touch of Zinc White. Using this same mix, outline some of the cut grass in the foreground, the fingers of cut grain, the bottom of the shawl, and add some outlining to the wheat field. Paint in the two sails on the boat on the left hand side of the sea, and the whole of the boat on the right hand side. There are more boats in Gauguin’s painting but on a dolls house scale we cannot see them. 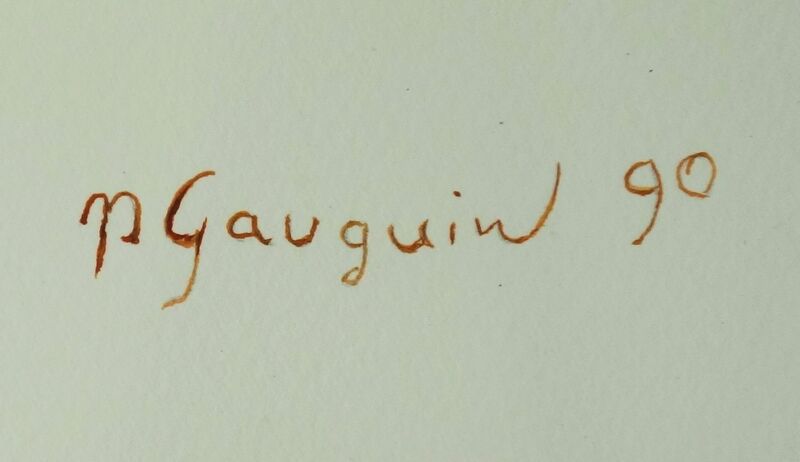 Finally, practise Gauguin’s signature on a scrap of paper using Burnt Sienna. Try out the whole signature in a large size, then work down until you have an approximation of his signature that is the right size for this painting. When you leave your paints you do not need to cover them as it doesn’t matter if your paints dry out. You can reconstitute them very easily by adding a drop or two of water, and it’s a good idea to add a drop to each dried out paint puddle in your palette at the start of each painting session, then it’s ready for you when you need it. The easiest way to do this is by using a fine mist of water – I use an old hair product spray bottle filled with water. When you need very strong colours use fresh paint from the tube.